Japan and the U.S. are two global leaders who must work side-by-side to spread peace and prosperity in the Indo-Pacific region. During his recent State of the Union address, U.S. President Donald Trump underscored the grave threat a nuclear North Korea presents to the United States and its allies and called on the international community to jettison the complacency and concessions that have proven ineffective. Our two countries, Japan and the United States, are in full agreement: successfully confronting a geopolitical crisis of this magnitude requires courageous leadership and strategic partnerships that span the globe. The U.S. and Japan are working closely with the Indo-Pacific region at large to resolve this challenge and to ensure global security and stability for the future. Japan’s prime minister, Shinzo Abe, recently reformed domestic legal systems to give more authority to our defense forces to closely coordinate with U.S. forces, positioning Japan, in certain cases, to be able to stand together with the U.S. in the need for collective self-defense. This coordination is critical, along with trilateral cooperation that includes the Republic of Korea, because the geopolitical challenges in Northeast Asia require Japan, the U.S., and the Republic of Korea to work together as one in order to contain the North Korean threat. All the while, China remains reluctant to accept and help defend the values that we cherish. If China wants to join the open and liberal world order in a responsible manner, we should welcome them. But if China wants to take advantage of the system in order to undermine it, or to replace it with their own system, we must dissuade them together. 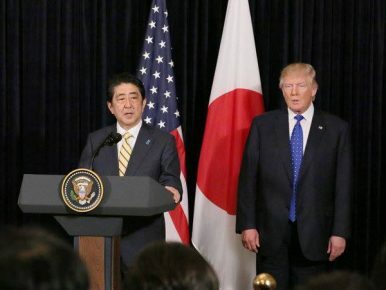 A strategic partnership on security issues is only one of the many ways Japan and the U.S. can work together in the 21st century. The U.S. and Japan have an opportunity to build upon our increasingly strong economic ties, which have greatly benefited businesses and workers in both countries throughout the past two decades. Japan now boasts the second-largest cumulative foreign direct investment in the U.S., and is the second-biggest foreign employer, having created almost 860,000 jobs in Japanese factories and offices across the United States. Likewise, U.S. direct investment in Japan has doubled since 2000, increasing from $57 billion to $115 billion. The rapid evolution of our economic relationship is truly remarkable: In 1991, Japan represented about 60 percent of the U.S. trade deficit, but today it constitutes only 8.6 percent. Beyond these opportunities we can foster a new era of economic growth and development throughout the Indo-Pacific region, which is home to more than half the world’s population. This is the greatest challenge of the 21st century: to create a free and open Indo-Pacific region that will help millions of people rise out of poverty and reap the rewards of the developed world. Prosperity, after all, is the greatest foundation for peace. Most Asian countries are better prepared than ever before to work towards promoting democratic ideals of freedom and prosperity around the world and to defend against global security threats. Since the late 1980s, Asian nations have embraced these ideals, one after another. The Philippines became a democracy in 1986, and South Korea, Indonesia, Malaysia, and Thailand followed. In retrospect, the self-determination of Asians seems like an inevitable denouement of history. But Japan and India paved the way. Japan is ready to lead again, this time, to create a free and open Indo-Pacific region by supporting freedom of navigation and maritime law enforcement, as well as infrastructure upgrades in a way that meets global standards. Japan and the U.S. are two global leaders who must work side-by-side to spread peace and prosperity in the Indo-Pacific region. We share a deep-rooted conviction in the fortifying power of democratic values and free and fair economic opportunities. With this in mind, and with unwavering commitment, now is the time for Japan and the U.S. to stand united on the world stage. Nobukatsu Kanehara is the Assistant Chief Cabinet Secretary and Deputy Director-General of the National Security Secretariat. He previously worked in the Japanese Ministry of Foreign Affairs. Abe’s addiction to coal prove his empty words on climate change action.